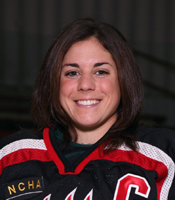 WINONA, Minn. - The Forester womens hockey team began 2007 with back-to-back 4-1 victories at St. Marys University over the weekend (January 5-6). Lake Forest is now 7-1-3 on the season while the Cardinals fell to 2-8-2. The Foresters scored the first two goals of Friday nights contest. Senior Katie Snowden (Toronto, Ont./Willowdale Redwings) put the visitors on the scoreboard at 5:32 off an assist from junior Courtney DeHoey (Chatham, Ont./Bluewater Jr. Hawks). Snowden and freshman Carolyn Thiess (Naperville, Ill./Canterbury School) then assisted junior Laura Wilson (Corunna, Ont./Sarnia Sting) at 12:08 on what turned out to be the game winner. St. Marys closed to within a goal just 42 seconds later but that would be the home teams only score of the contest. Junior Devin McGuire (North Truro, Mass./Groton School) scored for the first time this year at the 5:12 mark of the seconds stanza. She was assisted by freshman Sam Pinsonneault (Manchester, N.H./New Hampton School). Junior Allison Rushing (Seattle, Wash./Seattle Admirals) added an unassisted power play goal at 7:51. Senior goaltender Sally Bevis (Huntington, N.Y./North American Hockey Academy) stopped 23 of 24 shots on goal Friday night and freshman Ryann McCarthy (Lombard, Ill./Team Illinois) posted the same numbers on Saturday. The Forester net-minding duo has combined for a .915 save percentage and 2.31 goals against average in 11 games this season. Junior Jen Clouthier (Aurora, Ill./Chicago Mission) started the scoring on Saturday with her fifth goal of the year. Rushing was credited with the only assist. Wilson converted a power play opportunity at 8:54 with DeHoey earning the assist. The goal was the team-high 10th overall and third game-winner of the season for Wilson. The Cardinals scored a short-handed goal with 5:07 remaining to close out the scoring in the first period. Rushing scored her second unassisted goal of the weekend and third tally of the year at the 5:06 mark of the second period. Wilson and DeHoey assisted as Snowden added her second of the weekend and fourth of the season at 10:15. As it was the night before, the third period was scoreless. Lake Forest will continue non-conference play next weekend (January 12-13) at home against Gustavus Adolphus College, which entered the holidays ranked third in the nation. The teams will face off at 7:00 Friday night and again at 2:00 the following afternoon.